Welcome to my iThemes Exchange Membership review. If you’ve never visited my site before, there are a few things I cover on this site regularly. One of them is WordPress membership sites. I look at plugins and review them so that you can make a good decision when picking from all the options you have. There are a lot of membership plugins for WordPress. Yes, there are actually more than 30 options. This is review #29 focused on iThemes Exchange. As I scored the previous plugins, I looked at 8 different factors. The core of the question is whether a variety of gateways are supported. Industry standards like PayPal and Authorize.net should be standard. Stripe is a pretty huge expectation. After that, the question is about variety. Are there many? There are many other features that I constantly monitor but they’re unique and pretty darn specific so these reviews would be horribly long and boring if I added all of these other features in. That said, there are a few that are fan-favorites. And the truth is, they did bring something new to the table. At the time, the membership solution for WooCommerce was a complicated mess than required several extensions and tons of clicks. Easy Digital Downloads, at the time, wasn’t really focused on membership solutions, and the WP eCommerce solution was pretty old and hadn’t been looked at in a while. In other words, iThemes Exchange brought a powerful solution for membership sites that the other eCommerce solutions hadn’t focused on. It’s what put it at the top of the membership plugins in 2014. Of course, in the last year, Restrict Content Pro (which can work with EDD) has been improved. And WooCommerce now has a real membership solution.
.@iThemes has driven everyone forward when it comes to membership solutions. The competition continues to push everyone to get better – which is a great thing for users. Do you know Timothy Jacobs? Before I go into the details of my review, I need to mention Timothy Jacobs. He runs the site IronBound Designs. I like Timothy because he attended a talk I gave in New York where I highlighted one of the areas where iThemes Exchange could get a bit better. You know what did? He built it. It’s a powerful solution for group memberships which are linked. There are few plugins that support the feature (like Paid Memberships Pro), and now iThemes Exchange is better because of it. He’s created several other extensions as well, which you should check out. Building a platform is easy. One of the best features that you get with iThemes Exchange is the platform it provides for eCommerce. What I believe is that your membership site will eventually shift into an overall eCommerce site. You’ll sell a book. You’ll sell a t-shirt. You’ll sell something and when that happens, you’ll want your customer to have a single consolidated user account. Not sub-domains. Not multiple sites. One site. You want your customer to have a consolidated user account, which they get with @iThemes. And iThemes gets this. And so, because they do, you get it too. I shouldn’t tell you that building a platform is easy. It makes it sound like that’s the only thing that’s easy. And that’s the wrong idea. Everything is easy with iThemes Exchange. My favorite feature and the absolute easiest to manage is the scheduling of content. This drip feature is so easy to use it’s crazy. Without a doubt, it’s the simplest screen of all 30 membership plugins when it comes to configuring drip access.
.@iThemesExchange is the easiest of all 30 plugins when it comes to configuring drip access. If you’re building a site to protect content, you ought to consider this plugin simply because of how easy it is. One of the requests I get a lot is the request for bbPress integration when it comes to all the membership plugins. Guess what? 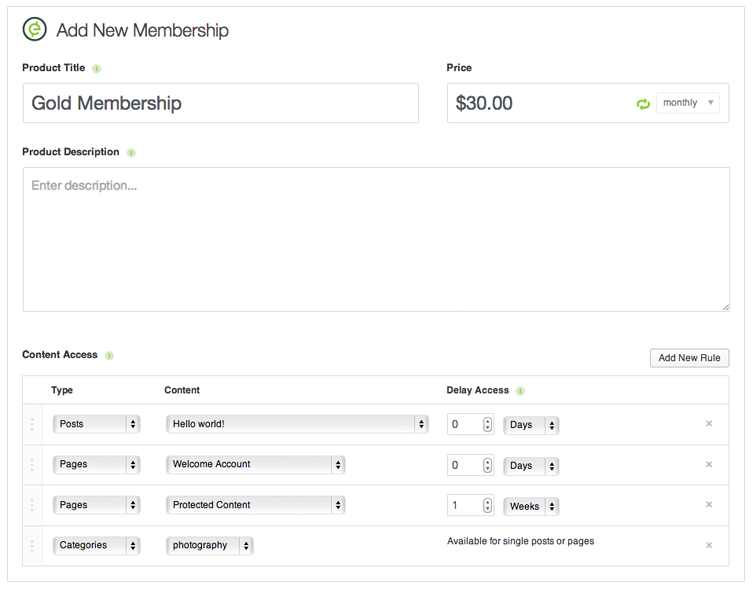 The Pro-Pack for iThemes gets you not just the membership extension, or the Stripe extension. It not only gets you the MailChimp integration. 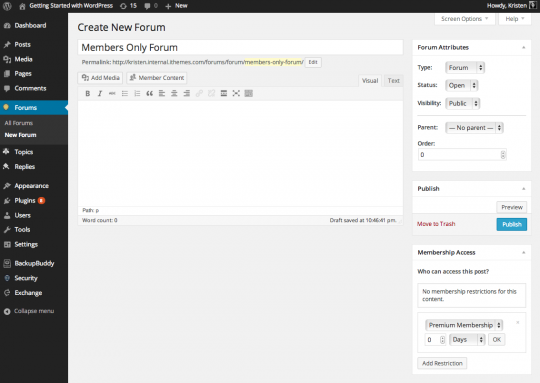 It also gets you the integration with bbPress for a members-only forum. That’s why the ProPack is the right call! The ProPack from @iThemes for Exchange is the best ever! Some membership plugins work with BuddyPress. Others don’t. Actually, let me be clear – few do. Of the whole list of plugins I reviewed, only a handful do. But guess what? iThemes Exchange does, using an extension that comes as part of the ProPack. Let’s talk a little about the math they’ve done to let users upgrade (and get their fees pro-rated). iThemes had already did work on upgrades and pro-rating to make sure the math was right. But what if you wanted more? What if you wanted to use a fixed period for a membership, like a single year? Then the pro-rating would have to work differently, right? Well, good news. Remember that Tim guy I told you about? Check this out: A pro-rated extension for free. So now, whether you have a non-fixed plan or a fixed-term membership, you’re good to go with prorations.